This week, the last days of the Sun’s passage through Cancer will be felt like a lingering daydream, where the presence of myth and memory create an admixture of visionary moments. Though Cancer season is a lovely oasis to languor in, a thrust of evolutionary instinct will occur this week, transforming quiet feelings into boisterous actions. On Thursday, Mars will be shifting into the fire sign of Leo inspiring new bravado and acting as a herald for the Sun’s triumphant entry into its sign of rulership over the weekend. As the Sun re-enters its golden domain, you will be endowed with new courage and a dazzling personality. With the Sun, Mercury, Mars, and the North Node all ensconced in the lion’s realm by the weekend, your love for great legends of the past will blossom into the gnawing desire to become one yourself. 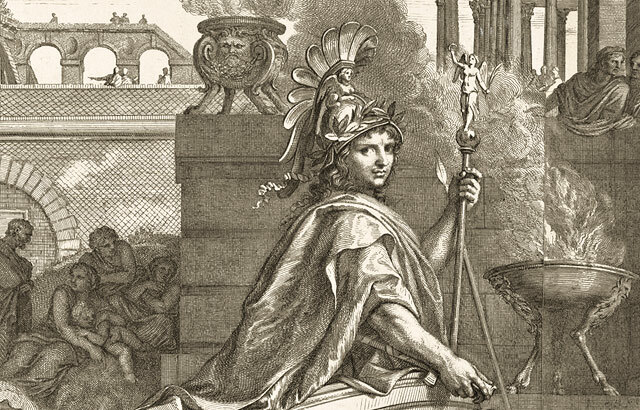 To understand how it will feel to experience the last lingering days of Cancer’s womb-like enchantment followed by the shift into Leo’s gleaming house of the Sun, it would be instructive to examine fragments from the mythic and historical biography of the Alexander the Great. The King and Queen of Macedon invited the greatest prophet of the land, Arixstandros, to interpret their dreams and his declaration was that Olympias was pregnant and that her child would be bold and fierce like a lion. So even in the womb Alexander was poised and ready to become a lion. In many ways, this story is the perfect embodiment of the energetic weather this week. Though still safe in the womb of Cancer season, you will receive many signs of Leo’s approach. With eyesight and claws sharpening, you’re almost ready to make a very powerful move. When Leo arrives, expect creativity, courage and enthusiasm to burst forth. Alexander the Great’s exact birthdate is unknown. Almost all sources agree that Alexander was born in 356 BC “on the 6th day of the ancient Greek month of Hekatombaion” which some sources convert to July 20th. Though it is difficult to be certain about the conversion of dates from ancient Macedonian calendars, it is known that they measured their months by the phases of the moon. Thus, Alexander was likely born between July 20th and August 18th of 356 BC. 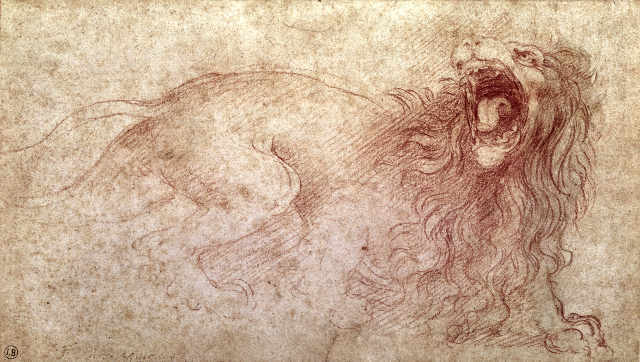 Prophesied to be bold and fierce like a lion, he was also born when the Sun was in Leo. His introduction to the world was bathed in fire. According to legend, on the day of his birth the great temple of Artemis at Ephesus (one of the seven wonders of the ancient world) burned to the ground. Raised as the embodiment of the belief in the divine right to rule, Alexander began his conquests at age 20 believing that he was the son of Zeus. His life was lived as an embodiment of the Arian Age, which abounded with solar myths of conquest and valor. The heroes of Homer, Aeschylus, and Hesiod were in Alexander’s blood. As he conquered the known world, his mythic vision of his relationship to the gods of his Age loomed larger. When Alexander arrived in Egypt, it is said that he was greeted as a liberator by the Egyptians who had long been held captive by the Persians. In the wake of his triumph, he founded the city of Alexandria which would become the cultural and intellectual center of the world. From Alexandria he marched onward towards the desolate desert, to visit the famous oracle of Amon at Siwah. The temple of the oracle of Amon was one of the most famous in the ancient world. According to legends, the heroes Heracles and Perseus had visited. Thus, Alexander deemed it necessary that he should speak to this oracle as well. When Alexander reached the oracle’s oasis, he was proclaimed to be the the son of Amon, which was the Egyptian equivalent of Zeus. Remembering what his mother had told him about his real parentage, Alexander lived the rest of his short life thoroughly convinced that he was a demigod, son of Zeus-Amon. If you agree with this sentiment, then the story of Alexander is not so much about debating his sanity or the morality of his character, but is instead about examining the great symbols that he embodied. As one of the kings of the Arian Age, he brutally conquered and colonized. But he also built the empire that summoned the subsequent Piscean Age to come forth. In his 12 years of conquest, (one Jupiter cycle) Alexander founded seventy new cities. He diffused Greek culture and customs all over the empire, creating the Hellenistic world that for many centuries was the center of flourishing philosophy, arts, science and religion (including Christianity). Alexander’s Age of Aries made its transition into the Age of Pisces through the blending of diverse ideas, so freely shared in Hellenistic culture. 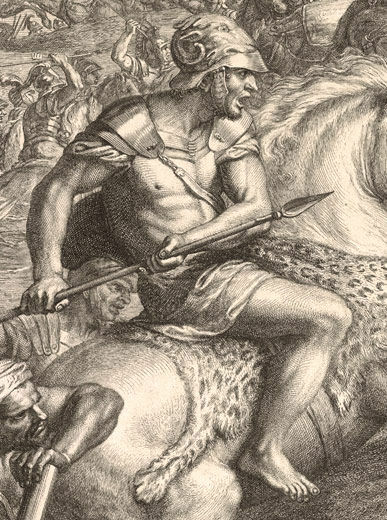 Despite the fact that Alexander the Great is associated with the Age of Aries, he was a born with his Sun in Leo. Thus, you must examine his motives for war through a leonine perspective. His conquests were not so much about wealth and land as they were about glory and the urge to live out and perform the heroic myths that he believed in. It is clear that by the time he visited the oracle in Egypt, that he believed he had attained divinity through his performance. On a smaller scale, the season of Leo will incur the same sort of desires within you. For life to have any zest or any sparkle, it demands that you offer some conscientious performance of your role. If you understand your life in mythic terms, as Alexander did, then you will be greatly inspired and encouraged by the grand narratives that weave humanity together. You will find yourself embodying characters and acting out scenes whose narratives are already known to you through the lives of historical figures and legends. Rather than feeling trapped in repetition, during Leo season, you will feel encouraged to offer a memorable performance of a familiar role, one that leaves an indelible mark upon the world. On Monday, Venus in Gemini will square Neptune in Pisces. This is a day you may feel lost in a haze and lost in maze. In particular, you will be troubled to sort out and understand your feelings. There may be many confusing emotions that arise in response to information. Try not to give in to Venus in Gemini’s penchant for clever responses. Simply accept the strangeness as you would accept a white cloud of vapor passing over you while sitting by the ocean. The dreaminess can be lovely if you are open to the surreal. Also on Monday, towards the evening, Mars in Cancer will square Uranus in Aries. You may feel a surge of rebellion, especially towards something you identify as cloying sweetness or smothering affection. Issues of codependency and dependency will likely be confronted. Knowing that the Venus/Neptune square has you confused about your feelings, try to respond to these pressures and concerns in a manner that is constructive and inventive rather than destructive and wrathful. Tuesday brings angelic intervention. Venus in Gemini will trine Jupiter in Libra, offering ample opportunities to receive golden opportunities. Expect to be treated very kindly today by those who embody good fortune and love in your life. With the trine between Venus and Jupiter still humming in the background, the middle of the week brings another harmonious aspect between Mercury in Leo and Saturn in Sagittarius. This is a day to make a plan that has the power to succeed long term. This is a day where you can order your thoughts and write down your ideas in a structured way. You might also be gifted with extraordinary powers of analysis. On Thursday, Mars will enter into the sign of Leo, heralding the return of the Sun’s in its rulership. 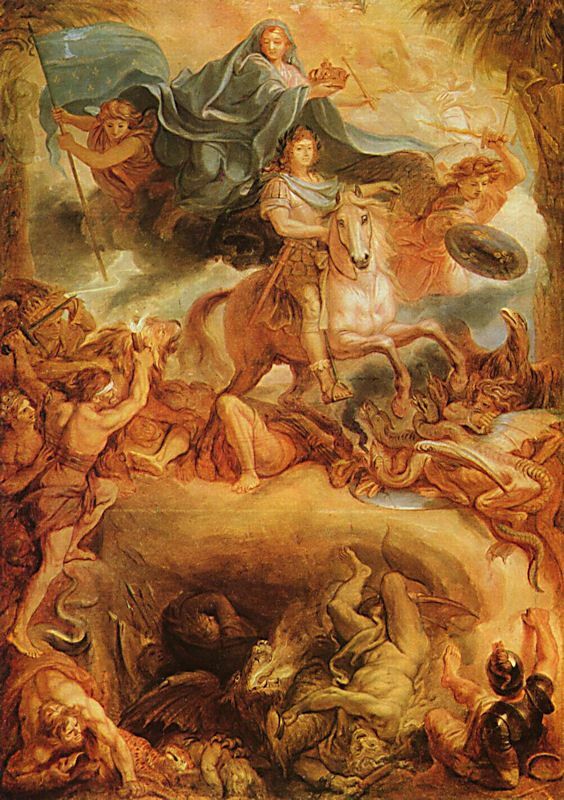 To understand the shift in martial energies, imagine Alexander the Great as a young man being guarded by his mother versus Alexander the Great being unleashed upon the world as a warrior. Imagine the first few days of Mars’ transition into Leo as having an unleashed and galloping quality, only known to animals that have been penned. Thus, you may feel a sudden burst of energy. Mars in Leo flares brightly with vanity and pride and the real challenge for this placement is to refine this into legitimate strength of character. Following the golden triumph of Mars, on Saturday July 22nd, the Sun will return to its sign of rulership in Leo. Greeted by golden warmth and glittering colonnades, the Sun’s joy will become your joy, filling you with new light. Support is now here to help you perform your role in life with a little more flair. This collaboration continues on Sunday, when the New Moon in Leo occurs with a conjunction to Mars. The sign of Leo will be home to two New Moons this year, this one on July 23rd and the climactic eclipse next month on August 21st. Though the energies of these two Moons are related, this first one is an initiation of something really grand. You are being offered a chance to stretch yourself, to make malleable what is usually considered fixed. Thus your sense of limitation as a personality, as a creative, and as a lover can all be altered at this time. Even if this change is catalyzed by conflict, find the courage to welcome a new growth spurt. It is time to identify yourself with something reified, dignified, and holy. Or to put it more simply, this is your time to shine!